Beach Getaway - 8mins walk to the beach! Brand new, clean, modern, Scandinavia chic design! You will love every minute spent at our gorgeous beach villa. The most beautiful beach is a short 8mins stroll to the end of the street. You can leave the car in the garage and walk everywhere! 15minute stroll to the Dromana Hub shopping precinct, fabulous restaurants, great little bars, a lively pub and a great supermarket; all just a 15min stroll away. The property is near new, beautifully appointed with all the mod cons. A spacious open plan kitchen/living area opens out to the deck which gets all the beautiful afternoon sun. The villa is fully equipped with everything your kitchen at home has, designer furniture and dressings and an easy to use Weber Q set up on the deck to enjoy some sunset cocktails with dinner on the BBQ! The bedding configuration is 1 x King Bed, 2 x Queen beds (bunks) and we'll even let you squeeze in 1 more on the super comfortable chaise lounge. There is a full undercover secure garage so your car will be safely tucked away while you explore the area on foot - why not! You can walk everywhere in minutes! We also have 4 mountain bikes at the property ready for the more adventurous to start exploring. We love the Peninsula and are passionate about everything that Dromana has to offer. We enjoy our villa as much as we can on the weekends and holidays and we know you'll love it too! The beach at the end of the street is just beautiful. There are some great restaurants and bars within walking distance and of course the Hot Springs and the wine region just down the road - what more could you want! Our villa is only 18months old. Its beautifully decorated and in prime position to enjoy everything the peninsula has to offer. 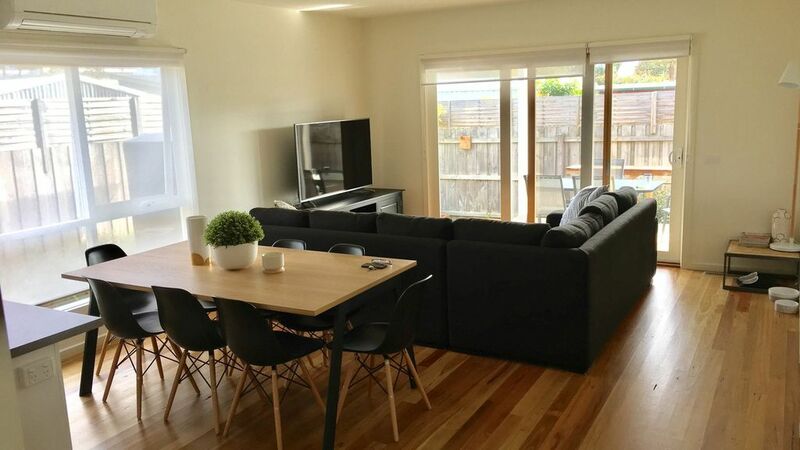 Its modern, cozy and spacious for a family a couple or a friends weekend away! - You'll love it! Everything about the Peninsula is unique! From the beach to the mountains - its all at your doorstep! Extra Large walk in shower, modern furnishings and large basin with super big wall mounted mirror. We are an 8min walk down a lovely quiet street to the beech - about 700metres! All linen is provided and is luxurious 500 thread count. There's plenty of towels and other accessories too. Comfy open plan living room. Large 8 seater sofa and coffee table with huge TV! The pantry is stocked - feel free to help yourself to whatever you need! Heaps of everything that you could need; plates, bowls, cups, pans and pots - and the all important cheese platters are there too! New gas appliances, double sink, open plan concept - its as new! Open plan kitchen, dinning lounge. The dinning table seats 8 people. Extra large flat screen HD TV. There's also a 2nd smaller LCD flat screen TV available in the master bedroom. There's a small garden with some grass incase the kids want to be outside. We have 3 bikes that you are welcome to use in the shed! BYO helmet! Good size outdoor undercover deck/patio. There are 3 steps up in to the property from both the front and back. Our villa is just lovely. It has everything you need. All the amenities of home in a beautiful setting close to it all or as far away from the world as you want to be - its up to you! Comfortable, clean, modern and highly recommended. We were a family of 5 (children aged 11, 6 and 3) and honestly we had a fantastic stay at the villa. The place was certainly spacious enough to keep everyone happy! Accommodation was comfortable, clean and the staples in the pantry were an added bonus. The place really had everything we needed and although modern had a very cozy feel to it. Location is also so convenient to shops and the beach. Highly recommended and we would definitely come again! Great little place with a nice atmosphere. We travelled as a couple and the place certainly is better suited to smaller groups otherwise you will start to trip over each other. It was great to have everything in the cupboard including all condiments, sauces, spices as well as a heap of other products so you can really just get the basics and you are set. Very well appointed here. Beds were comfy and wonderful bathroom. About the only thing we would have loved was Internet, but the 4G reception was fine so we just used that instead. Recommended for couples touring around the area. About a 15 minute walk to the shops. Dromana has some great stuff to see. Cute and convenient villa, close to shops and beach. Thanks so much for your review Anna! We’re so glad you enjoyed your time down the peninsula and we’re lucky enough to get some great weather too! We’d love to welcome you back again some time in the future. Have a fabulous 2019! The property is a walk from the beach and main strip of great cafes. Clean, modern and lovely accommodation. Perfect for a place of your own for some time away in the Peninsula. Thanks so much for your review Sarah! We’re so happy you enjoyed your time down the peninsula and had a great stay at the villa. We’d love to welcome you back again in future. We are in the heart o the Peninsula! Everything you could want or need as at your doorstep! 12mins drive to the amazing winery region of Red Hill, 15 mins drive to the Peninsula Hot Springs - lots of bars, restaurants and shops all within a walk, bike ride or short drive! And don't forget - beautiful Dromana beach is right at the end of the street; the perfect place to watch the sunset!